The Office of Hawaiian Affairs’ (OHA’s) Papakilo Database, is the ongoing development of a cutting edge and comprehensive “Database of Databases” consisting of varied collections of data pertaining to historically and culturally significant places, events, and documents in Hawai'i’s history. This online repository of data will greatly increase OHA’s ability to preserve and perpetuate cultural and historical information and practices, thus providing an invaluable resource to educate other regulatory agencies, OHA’s Native Hawaiian beneficiaries, and the general public. The name, Papakilo, was provided by Puakea Nogelmeier and Kau'i Sai-Dudoit and selected by OHA's CEO, Ka Pouhana Dr. Kamana'opono Crabbe. The definition of Papakilo is “a foundation for seeking, searching, observing.” Dr. Crabbe expands on this definition by saying that the name, Papakilo, "embraces the function of the database which not only implies seeking or to search, but the continual exploration of infinite spaces, levels of knowledge as a perpetual cycle for the next generations to come." To view a video of the Papakilo Launch Event on April 4, 2011 - click here! In 2009, the Papakilo Database, which was placed in the newly developed division of Research, was identified as a vital key to addressing several newly created Strategic Priorities and Results from the OHA’s Kukulu Hou reorganization efforts. 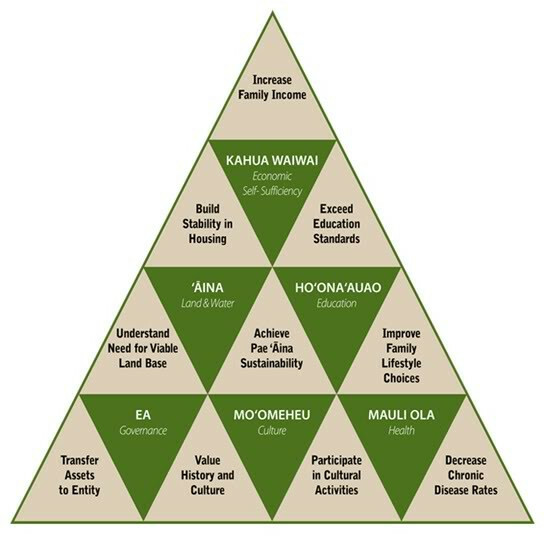 Under the new Strategic Plan, OHA further recognizes the inter-relationship among the issues facing Native Hawaiians and defines a series of “results” that acknowledge these connections. Such is the case with the Papakilo Database. This collective and one of a kind project addresses the following Goals: In 2009, the Papakilo Database, which was placed in the newly developed division of Research, was identified as a vital key to addressing several newly created Strategic Priorities and Results from the OHA’s Kukulu Hou reorganization efforts. Under the new Strategic Plan, OHA further recognizes the inter-relationship among the issues facing Native Hawaiians and defines a series of “results” that acknowledge these connections. Such is the case with the Papakilo Database. 'Aina – To maintain the connection to the past and a viable land base, Native Hawaiians will participate in and benefit from responsible stewardship o Ka Pae 'Aina O Hawai'i. Mo’omeheu – To strengthen identity, Native Hawaiians will preserve, practice and perpetuate their culture. Ho’ona’auao – To maximize choices of life and work, Native Hawaiians will gain knowledge and excel in educational opportunities at all levels. Exceed Education Standards – Percent of Native Hawaiian students meet or exceed standards in elementary, middle, and high school testing, and who graduate from post-secondary institutions. Understand Need for Viable Land Base – Percent of all Hawaii residents understand and agree that a viable land base is necessary for the new Native Hawaiian governing entity. Achieve Pae ‘Aina Sustainability – Percent of Ka Pae ‘Aina O Hawaii managed to create economic value, preserve cultural and natural resources and historic properties, and/or provide cultural and social opportunities for Native Hawaiians in a sustainable and balanced manner. Value History and Culture – Percent of all Hawai’i residents appreciate and value Native Hawaiian history and culture as a basis for residing in Hawai’i. Participate in Cultural Activities – Percent of Native Hawaiians participating in cultural activities, including language, who interact with the ‘aina for cultural spiritual, religious , and subsistence purposes. OHA's mission is "To malama Hawai'i's people and evironmental resources, and OHA's assets, toward ensuring the perpetuation of the culture, the enhancement of lifestyle and the protection of entitlements of Native Hawaiians, while enabling the building of a strong and healthy Hawaiian people and nation, recognized nationally and internationally. The Papakilo Database aligns with this mission on many different levels and empowers OHA to take on the responsibility of safeguarding valuable historical and cultural knowledge. The 'Olelo No'eau "O Ulumaheihei wale no, iaia o loko, iaia o waho" speaks of Ulumaheihei, the most trusted friend of Kamehameha, and his extensive knowledge of kingdom affairs. Because of his history of stewardship, he was also the individual entrusted with Kamehameha's 'iwi (bones) after the King's death. This project seeks to follow in the footsteps of Ulumaheihei and become the trusted steward that preserves the history and culture of our people, before they are lost to us forever.